Jeremy and I have always loved our Friday-Sunday time together, but it has gotten even better since Haven's arrival. We ate lunch together uptown Friday and grilled out with the Bradley's that night. I finished the Sally's Y 5K (actually it was like an 8K) in the 85 degree weather on a terribly unsafe course. Way to go MAMA! My first race post pregnancy. Hopefully I will do better Saturday at the Mt. Holly Springfest 5K. Sunburned shoulders hurt! My favorite picture of tummy time to date. I love that dimple. Haven had a great time watching mom and dad eat while she sat in her highchair like a big girl. Hsven and I are going to eat lunch with Jeremy downtown today. Pictures coming soon. Jeremy brought us beautiful flowers yesterday. My fave! He is the best husband and daddy ever! I hope Haven will love color and flowers just as much as me, Aunt Wendy, and Grammy. This shirt says "Can you tweet too?" Bonnie figured out that the bird was asking this question to the cat. Yesterday Wendy asked her if she was tweeting on Twitter. Ha! Haven was watching Color Splash with David Bromstad when I took this picture so maybe she does love color! Haven and I had a photo shoot the other day in Jeremy's mom's dress from when she was a baby. I tried to use the light coming through the window and I got a few good shots, but nowhere close to Amber's beautiful pictures of Layla. I tried. I tried to get a few showing the details of the beautiful dress. We got Haven's Remember Me Preemie doll in the mail yesterday. She is custom made to be the size Haven was when she was born. I put Haven's hospital bracelet on her foot. I was excited to get the doll so we can see how much progress Haven has made over the last 19 weeks! Today, I finally got some pictures of my family. Bethany is growing so fast. Grammy and Pop love their babies. Jake is super funny. He had Uncle Jeremy playing hide and seek today, but at the count of 10 Jake always came out of his hiding place (pillows). He loves to talk about Uncle Jeremy, up high, play basketball, drums and cymbals. 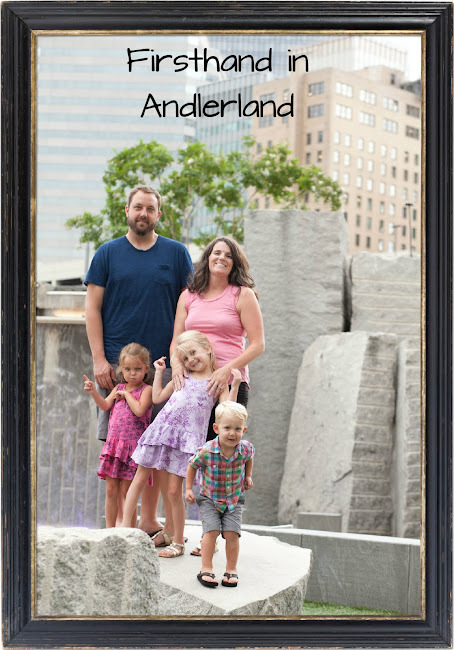 I've got to get Andler family pictures next time we see them. My sister got Haven the cutest Baby Legs for Christmas. I love them, but I couldn't figure out what she could wear with them. As I looked around at some websites I saw really cute shirts with appliques on them, so I decided to make Haven an owl shirt to match her Baby Legs. Daddy and Haven were playing Hide and Go Seek, but she hadn't found him yet. She doesn't look very happy. I am pretty sure she hates wearing a headband. I used my trunk of scraps and just sewed around the edges. I bought some glue to keep the edges from fraying and although it dries clear it doesn't look fabulous. So, next time I will seal the edges before I sew. (These pictures are pre-edging adhesive. )Any ideas on making shirts with scraps? How do I make the edges look better? I plan on making shirts for her at most holidays using my scraps. This post is edited for Show us where you live Friday at Kelly's Korner Blog. I am not sure when I started thinking that owls were cute. Maybe it was after seeing the Carolina Raptor Center presentation a few years in a row with my school kiddos. I think it may have been at the Christmas show when Wendy bought their little cousin a cute owl stuffed animal. No, I am pretty sure listening to Jake say "whoo, whoo" at Festival in the Park while we were looking at the owls started this whole thing. He is such a sweet nephew by the way. So, as I started working on Haven's nursery I knew I wanted a natural theme. That started with a very pretty limb I found in my backyard that I spray painted as a wall decoration. Then I knew I wanted to make her a family tree that she would have forever. I also wanted to paint a mural with woodland creatures. I used Michelle Prahler's art as an inspiration. She comes to Festival in the Park every year.. So, although there are very natural elements the color palette is a little more modern (Thanks to the small paint samples at True Value). Everyday I love Haven's nursery even more than the day before. Her owl mobile from Almost Sunday Designs really finished the room. If we ever move it will be hard to leave this room. I may have to cut out the drywall and take it with me. The big girl in her crib. Haven loves watching her mobile. She smiles and coos at it. The limb that started it all on the left and her family tree on the right. Her pretty coral curtains, glider, flower lamp, high shelf for books and toys, and signature picture from our showers. I loved painting this mural. The verse is Matthew 10:31. I also painted in peaceful words and her name, plus a few creatures. We had a great Easter weekend of relaxing and enjoying each other. We went to church and then had lunch at the Andlers. Haven with all her Easter goodies. Today Haven is 4 months old. The first 2 months went pretty slow, but the past 2 have flown by. We had her 4 month appt. with the early intervention lady yesterday and even though Haven isn't on a 4 month level, she is definitely on her way. Just yesterday she looked at her hands for the first time. She puts her hands in her mouth and now brings toys up to her mouth. She can sit for a few minutes in her little seat. She coos and gurgles at us and at her toys. She loves for her toys to tickle and kiss her. She sleeps without a swaddle and slept 10 hours last night! We are so blessed to have such a sweet girl. It's still kind of hard to believe. We went to our first egg hunt today with Wendy, Jake, and Bethany. We enjoyed watching Jake have a good time. Then we tried our best to take a picture of three grandbunnies. We are so thankful that Layla Katherine Norkett made it into the world perfectly. Amber is one strong mommy! We can't wait to see Layla virtually and then hopefully have a play date sometime before they are too old for that kind of stuff! What a rich childhood Layla will have on the other side of the world! Congrats to Amber and Casey! Haven now weighs 10 lbs 4 oz! She is growing so fast. She likes to be propped up now so she can look around as you can see in this cute picture below. I thought the "bow perspective" below would show how much Haven has grown over the past few months. The picture on the left is from my birthday post when Haven was 10 days old and the picture on the right is at 16.5 weeks old.